INTERVIEW: SEDO.COM TALKS ABOUT CHOOSING DOMAINS. Drivers in Las Vegas have long been forced to contend with a jerk who terrorizes the roads of Southern Nevada in a black Lexus with the license plate “dot com.” That’s me. I’m that jerk. I’m so nerdishly committed to my domain extension of choice, that I’ve gone so far as to tell the world on the back of my car! As it came time to write the very important guide for StartupStud.comabout selecting the right domain for a new startup, I had to find a way to set my own .com jerk stubbornness aside and provide the best available information about the latest market and SEO trends for domain name purchases. With all of these new domain extensions floating around, are “.coms” still king? What is the most current domain valuation process? How should someone choose the right name? Having these burning questions in mind, I reached out to our friends at Sedo.com for a truly data-driven, market expert interview about everything that needs to be taken into consideration when selecting a name. Far and away the undeniable leader in the global domain aftermarket, Sedo.com‘s marketplace offers more than 18,000,000 domain names and operates the most active domain exchange on earth. With more than 2,000,000 active members and staff working from 30 countries around the world, we would have been hard-pressed to find anyone with more reliable data to help cut through all of the noise you see online about domain names and extensions. Spoiler Alert: .coms are by far still the most valuable and used of all domain extensions! StartupStud.com: What recommendations does Sedo have for an entrepreneur seeking the perfect domain name at a price that is within their startup budget? Sedo: Most businesses, including entrepreneurial ventures, tend to overlook how crucial a domain name can be to their success in not only establishing the best online footprint, but how this fits into their overall branding. Avoid using a domain with too many characters or a bulky, unspecific, over-complicated domain name like chicagoaccountantandfinancialservices.com. Select domains that do not differ completely from your business or concept’s name which easily causes confusion among traffic to the website. Instead seek generic premium keyword domains improving SEO results and the likelihood of new business growth and development. Be open to exploring the unique and branded names now available to the right of the dot. A quality domain is essential to stand out from competition who in most cases is not utilizing the strongest name or strategy to emphasize their online footprint. Creating a strong online identity should be at the forefront in building an effective brand as well as taken into account during early discussions of launching a business, re-strategizing or implementing something new. We’re seeing this strategy being implemented among many companies like pharmacy chain CVS utilizing a customized domain, www.cvsquits.com when they launched their campaign around the removal of tobacco products. Great, innovative companies like the ones being birthed from the latest boom in startups lack a key component in the nearly unlimited amount of strategic and creative choices for their websites. We encourage our clients to think of their domain name as their company’s calling card as the days of business cards, phone book listings and printed bulky materials are slowly waning and the first impression a business makes is through their website. Liking StartupStud.com? You’ll love the Instagram. Click the photo to open the @startupstud profile and find the ‘follow’ button. StartupStud.com: What are the primary factors that determine a domain’s value? Sedo: A few of the major categories we take into consideration when placing a value on a domain are the TLD, length of the domain, linguistic suitability, and branding/commerce potential. When providing appraisals on particular domains we also always look to comparable sales data, which can be one of the most helpful indicators of a domain’s value in the current market. As with the real estate market, the domain market is constantly evolving. As such in the domain world, when seeking a valuation, you want to have the most current sales data to support any values quoted as a fair market value. StartupStud.com: Are .com’s still the most valuable TLD? If so, do you see that being the case for the foreseeable future? For how long? Sedo: .com names are still, by far, the most in demand domain name and our expectation for the foreseeable future is that it will stay in this position. Our current market data puts the average price of a .com name at $4,701 while the next highest selling TLD is .net at $1,429. .com is still the TLD that can be used for everything and has the broadest use case although names such as .web, .site and others have good potential, too. Strong arguments can be made for using the new TLDs such as shortening existing lengthy domain names with the use of the a new TLD or also using one that is more relevant and targeted for your business such as .club, .bar, .shop, etc. It is for the most part too difficult for the new names to compete on the same level with .com in the near future and in all fairness comparisons between long-standing TLDs and the new names should be withheld. Benefits to using a new GTLD is coverage of a vertical or a geographic area or anything else that further clarifies what your website and business are all about. StartupStud.com: As we’ve seen more and more domain extensions enter the registration landscape, what has the response been in the aftermarket in terms of these new extension’s valuations? Sedo: To date, the volume of sales has been relatively low when compared to .com and sales of other more established extensions but we at Sedo have been vocal about expectations needing to be set realistically. However, the number of sold domains under new TLDs on Sedo’s aftermarket has increased enormously: In 2013 we had domain sales under 160 different TLDs. As of today, almost 200 TLDs are traded on our market. If you look at this number, the new gTLDs are very successful. It is still too early to draw any conclusions about the success of the new extensions but the initial sales we’ve seen are good indicators for future price developments industry-wide. The ten highest public gTLD domain name sales at Sedo in the first half year of 2015 already demonstrate good indicators for some increased success of the new gTLDs. While domain investors can be quite prosperous by investing in domains and then in turn selling them, they tend to be skeptical with investing in the new gTLDs. On the other hand, smaller companies, startups and local businesses are quite keen on obtaining new gTLD names for their online presence. As a result prices for new gTLDs aren’t comparable to related .com names. Most end users can’t afford a costly domain purchase which is in line with our projections. The trading of gTLDs is still in its infancy, especially since not all TLDs have been released yet, including the most highly anticipated ones like .app or .web or .shop. If you look at past new TLD launches such as .co, whose good stats and global acceptance demonstrate the need for these domains but you also need a good test case using the TLD. .Co was fortunate enough to have for example Twitter use www.t.co, which created more awareness among users and therefore increased the value of .co names in the aftermarket. The same success is possible with .xyz, since Google’s new parent company Alphabet has decided to use abc.xyz. Other new gTLDs will profit from the publicity about .xyz as well.These test cases will have impact and influence on the value of TLDs in the aftermarket. We at Sedo believe the key to the success of these names is creating awareness among businesses and end users alike and in turn we’ve been focused on partnering with numerous new gTLD registries. Proactive marketing for these new names is at the forefront of our initiatives in this vast market of thousands of new gTLDs are competing with each other. It will take some time until we will see the effects of marketing effort among TLD Registries and as time progresses we may see that the number of new gTLDs decreasing since not every new gTLD will have the power, resources and budget to maintain solvency in the domain industry. StartupStud.com: Are the clients who are purchasing these new extensions in the aftermarket typically speculators or are you seeing them actually being used in commerce? Sedo: We have already seen users implementing new gTLDs for their online presence. Coffee.club is a perfect example of a new extension being used for an online e-commerce site. This service provides high-quality fair trade coffee delivery direct to their customer base. WhatRunsWhere – Discover your competitor’s most successful ad campaigns, copy and everything in between using WRW’s comprehensive toolset and reporting. WRW also offers access to an archive of every display and Ad Words ad that a competing website has run on paid ad networks. Moat – Provide another great display ad archive that lets you search by brand name. Bonus? You can just go to Moat’s site and search without signing up for anything. SocialAdNinja – Provides a specific focus on PPC ads on major social media networks. Fanpage Karma – Focusing specifically on monitoring your competitors Facebook business / fan page, Fanpage Karma provides insight into the most effective post strategies on Facebook audience engagement strategies. AdGooRoo – Adding another level of competition analysis and an effective tool to identify competitors who are using your trademarks to purchase and compete against your own ads, AdGooRoo is worth checking out. Adbeat – Spy on your competitor’s most successful ad campaigns, link copy and ad spend using AdBeat.com’s comprehensive toolset and reporting. Marketizator: Marketizator tops my recommendation list because they offer a powerful and simple to use testing interface that is free up to 10,000 tested views per month and also offers surveys and personalization. Monthly plans range from $55 and beyond. Optimizely: As one of the most popular options available, Optimizelyoffers a stunningly simple interface that is jam-packed with testing and data analysis features. Free trial available and monthly plans start at $17. Convert: With a two week free trial and available self-service plans starting at $26 per month, Convert‘s advantage is an impressive list of simple integrations with other platforms and services ranging from WordPress, Volusion, Google Analytics to even a few of the other more specific recommendations like Kissmetrics and Unbounce. Kissmetrics: If you are serious about analyzing data, Kissmetrics is one of the best available options for tracing your testing data down to specific users. Their offerings are impressive to say the least. And with packages starting at $150 with a 1-year commitment, it’s a good thing. VWO: Visual Website Optimizer is an excellent blend of powerful features with a still reasonable monthly service fee. At $49 a month, VWO offers A/B, Multivariate, Split URL, Targeting, Usability Tests, Conversion Tracking and Heatmaps, whereas many other services pack those into much more expensive packages. Unbounce.com: Unbounce is your go to if you’re ONLY focusing on split testing landing pages. That’s all they offer and they are pretty damned good at it. A 30-day trial is available with packages afterward ranging from $49 – $199 a month. Google Analytics: I’m a major fan of all things Google and use Google Analytics on a daily basis for every project I’m involved in. But when you get into some of the more advanced features, like their “Content Experiments” (their A/B Testing platform), you’re faced with a steep learning curve and some less than ideal visual testing features. Grammarly: Automatically finds & corrects mistakes of your writing, underlines errors directly in your web browser (*Strongly Recommend). GingerSoftware: Similar to Grammarly, but offers enhanced grammar correction at no additional charge (*Strongly Recommend). Reverso: Another spelling and grammar service, but only available on their website. Hemingway: Paste your text into their site and it will highlight complicated sentences, weak adverbs and more. Wordy: With packages starting at $49 for 1,650 words, Wordy offers a fast turnaround and has editors available 24/7 to work at a moment’s notice. Upwork: Formerly known as Odesk, Upwork allows you to search from many thousands of freelancers who are reviewed and work under the site’s guidelines. Freelancer.com: Similar to Odesk, allows you to search copy editors from their database of reviewed freelancers. ServiceScape.com: Another freelancer search platform. Headline Analyzer: Analyze your headlines for emotional impact and effectiveness. Masterclass: If you’re going to learn, you might as well learn from the most successful in the business. Masterclass taps into the upper echelon of various fields for educational video series. Usher teaches the art of performance, Serena Williams teaches tennis, Annie Leibovitz teaches photography and 19 time New York Times Bestselling Author James Patterson teaches his writing techniques. Expresswriters: Or just skip the writing altogether and hire someone else to write your articles for you. Egg Timer: Help your productivity by setting a timer for undistracted writing. Editorial Calendar: Schedule your blog posts by dragging & dropping into a calendar. Liberio: Create an eBook from your Google Drive. PlagScan: Check your text to see if it will show up as being plagiarized. Copyscape: Enter in your website URL to see if any content from your site comes up on other websites. TheAdminZone.com – All Encompassing Forum For Website Managers. Startups.co.uk – UK Based Entrepreneur’s Forum. SmallBusinessForum – Forum For Small Business Owners. TheFastlaneForum.com – Forum Community Based On The Millionaire Fastlane Book. WarriorForum.com – One of my favorites, WarriorForum is far and away the most popular forum to discuss internet marketing techniques. BlackhatWorld.com – Robust SEO Community, Covers Much More. GraphicDesignForum.com – Graphic Design Community Discussions. GetRichSlowly.com – Personal Finance Forum. CodingForums.com – Forum for Software Application Developers and Coders. Lynda – Lynda is the Rolls Royce of online training courses and is one that I’ve happily used for several years now. If there is a piece of software or relevant to online business skill set that you can think of, there are almost certainly 10 different kinds of courses on Lynda for it that are included in your unlimited monthly membership. CodeAcademy – Providing FREE interactive training lessons, Code Academy is perhaps the best online as it teaches you step by step everything you need to know about building code. While coding may not be for everyone, I’d recommend checking out the very basic HTML and CSS courses as they are quick and will give you a leg up on simple site edits. PluralSight – Another massive library of available eLearning, PluralSightprovides a more targeted focus on the technical elements of networking, servers, Microsoft specific and a very robust collection of developer courses. Digital Tutors – If you’re looking to learn game development, 3D, VFX and all of the related technical software courses that fall in between, Digital Tutors is your go to. Code School – Another excellent code specific resource, Code Schooladds video training into your in browser courses. TutsPlus – Another excellent training library in the creative space, Tutsoffers courses on code, illustration, photography, web design and more. 360Training – With everything from Food Safety, OSHA Training, Real Estate, Food & Beverage Training to an equally impressive list of Business & Personal Skills courses, 360Training has over 6,000 courses that cover specific training for employees and business owners alike. TrainSimple – Offers 6,534 training videos which specialize specifically on all things Adobe and web design. CreativeLive – Online training with an emphasis on professional photography, photography business tips and all things within the realm of a professional’s toolbox. Udemy – I both love and hate Udemy. On the plus side, they have a very diverse group of eLearning courses available for pretty much anything you could think to want to know (example: learn to start an eBay drop shipping business from A – Z), but you can never be sure if you’re paying what you should be. Udemy’s courses are individually priced and the internet is littered with coupon codes for them, ranging from 10 – 90% off. YouTube – As obvious of an option as it seems, we can’t forget YouTubeon this list! If you’re running into a problem, the odds are someone has made a how-to video about it. Just search YouTube and let them walk you through it. Google – Last but not least, don’t forget your old safety here. If you still don’t know something, Google it! Canva – Don’t know how to use Photoshop? Use Canva! It’s an amazingly simple (and free) graphic design tool that works in your browser, complete with fonts, icons, free-to-use images, ideas and online training. Fotor – Photo editing with a focus on filters and designing graphics with your image for cards and what not. Skitch – Easily add arrows and annotations to your photos to get your point across with fewer words. Easel.ly – Offers an array of fantastic looking templates to use in creating stunning infographics. Social Image Resizer Tool – Optimizes images for social media. Pixlr – Another in browser photo editor, Pixlr gives you the tools you need to make simple photo edits. Placeit – Superimpose your products, designs and websites into pictures of various electronics (example: your site on an iPhone, monitor or tablet). Recite: Turn any quote into a cool poster or graphic. Majestic SEO – As one of the largest and most frequently updated indexes of backlinks, Majestic is a solid tool to check up on everyone. 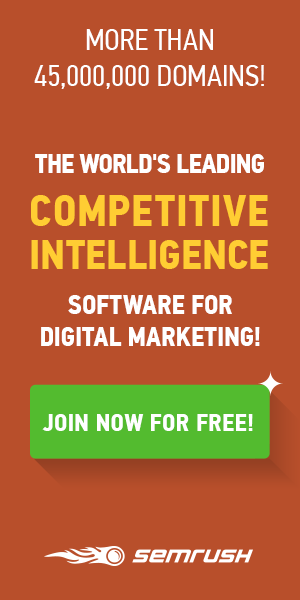 Cognitive SEO – Offering a free 14 day trial, CognitiveSEO is an excellent tool for bloggers and small business owners who want to keep an eye on the links and keywords that funnel traffic to their sites and competitors alike. Link Prospector – This isn’t as much for your competition, but I’ll toss it in here because it’s pretty useful. When you’re trying to build quality back links and improve your site’s authority, it helps to have a cheat sheet on your best prospects. Link Prospector identifies a variety of possible opportunities for your site, ranging from guest columns to contests and you name it. Naminum – Type in a word (or words) and it displays a list of that word with letters added to it. Short Domain Search: Lists all currently available short domain names. Wordoid – Scouring your brain for a unique name for your next product, company or domain? Boost your inspiration with suggestions generated by an intelligent naming tool. Impossibility – Search the word you want and it will search available domains with other words attached to it. Lean Domain Search – Type a word you want included in your domain and see a list of available domains. Domainr – Quickly searches all domain extensions for any word you type in. SEMRush – This is currently my favorite of the keyword analysis tools because it looks at it from a competitive perspective and ranks sites based on their nearest obvious competition. KeywordSpy – This tool gives you a combination of insight into a competing website’s organic keyword traffic and their paid Ad Words campaign (when applicable). SpyFu – Similar to SEMRush, SpyFu leans towards competitive analysis and will provide even more data to go off of from a varying perspective. iSpionage – iSpionage also lets you put in your target keywords to get a list of the primary competitors. Another awesome feature is their estimation of the monthly Ad Words spend of your competition. KeywordCompetitor – Similar to KeywordSpy, KeywordCompetitoroffers a second opinion on the same organic keyword traffic and paid Ad Words campaigns. The Search Monitor – TSM is a paid service only, but additionally offers tools unique to the Affiliate Management space that can help you track who is doing what – especially your own affiliates that are on your payroll! Portent – Creates (possibly) attractive article and title ideas for any keyword you put in. Facebook Trending – Check the upper right panel of your Facebook news feed for the latest trending stories. Google Trends – Find out what is trending on Google right now. Buzzsumo – See what type of content performs best for any topic or website. Hubspot Blog Topic Generator: Type in three nouns and Hubspot generates a week’s worth of recommended content ideas. Trendsmap – What are people Tweeting about where? Quora – What questions are people asking about? Find out and write about them! Reddit – See what people are talking about and think about what you can add to the discourse! Archive.org – Known as the “Wayback Machine,” Archive.org has a stunningly accurate archive of how the internet has looked over the last long while. Plug a website domain in and you can instantly see working snapshots of how it looked in the past. Use this to see how a website looked in the past, when it really first started and what changes they’ve made over time. WhatWPThemeIsThat.com – If you’re looking at a WordPress site and want to see if you can detect what commercial theme they are using, this is a great little tool. WhoIsHostingThis.com – If you are curious where a website is hosted, this simple tool will give you the answer. Alexa – As the most popular website ranking service available, Alexawill provide a general ranking of popularity for every website that’s been around long enough to be in their index. While not always perfect, Alexa is often the go-to for figuring out where everyone stands. SimilarWeb – After deeming your competition worthy through Alexa, you can then dig deeper into their traffic patterns and competing sites using SimilarWeb.com’s analytics toolset.